If you have grilled tofu before, I'd like your advice on how to get a firmer texture more like...a deflated steak-cut french fry (?) 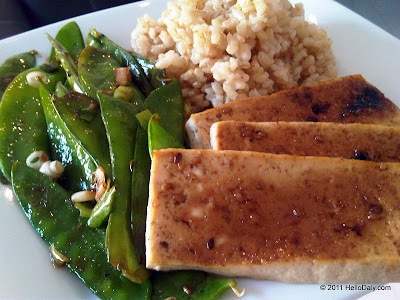 rather than pudding when making this Broiled Tofu and Snow Peas dish from Everyday Food. I read that I can put the block on a colander or sieve and weigh it down for 20 minutes per side to get the excess water out so I will try that next time. I know John is not hot on the texture but he did like the flavor of the vegetables and tofu. Heat broiler, with rack in top position. Cut tofu crosswise into thirds. In a small bowl, stir together ginger, soy sauce, honey, and 1/2 teaspoon oil. In another small bowl, toss together snow peas, scallion, pinch of red-pepper flakes, and 1/2 teaspoon oil; season with salt and pepper. On a rimmed baking sheet, arrange tofu in a single layer; drizzle with half the sauce. Broil tofu 2 minutes, then add vegetables and broil 1 minute more. Serve tofu and vegetables on rice and drizzle with remaining sauce. I must admit I cheated by using Trader Ming's Sesame Ginger Vinaigrette as a shortcut to making the sauce for the tofu. There's another brand I cannot think of at the moment that (is the best and) would work better because the sauce is a little thicker and has more teriyaki flavor. After the tofu was under the broiler for 10 times longer than in the directions, it was still not as crispy as I would have liked so instead of broiling the vegetables, I sauteed them instead which I was happy with. This is an easy, simple dish and I plan to make it again...but first there are tons more recipes to try! What?!!!! Tofu? The only time I've eaten tofu is when I make pad Thai. I personally don't like the texture of it but when I put it in pad Thai I ended up tricking my family as well as myself...they think it's chicken! The texture seems to be a turnoff for many folks who've tried tofu. I read a tip somewhere about how to cook tofu so it has a little more firmness and is texturally more like chicken...the trick is to place paper towel over the block and something heavy over the paper towel to weight it down for about 20 minutes (per side) and press out all of the juice.